Pennsylvania College of Art & Design has completed the construction of a brand new arts and technology center. This is a multi-purpose space for all students consisting of 21 Cintiq tablets, 21 desktop computer work stations, a new sound room, and a green screen room. This project, led by Academic Dean Marc Torick, Academic Dean, Director of Institutional Technology Derrick Gutierrez, Director of Physical Plant Dan Freiler, and Alex Leonhart, IT Tech Support Specialist, will serve all departments at the College. It is divided into 5 separate zones including a Cintiq Lab, A Sound Room, A Green Screen Room, A Critique Space and a meeting/work space. 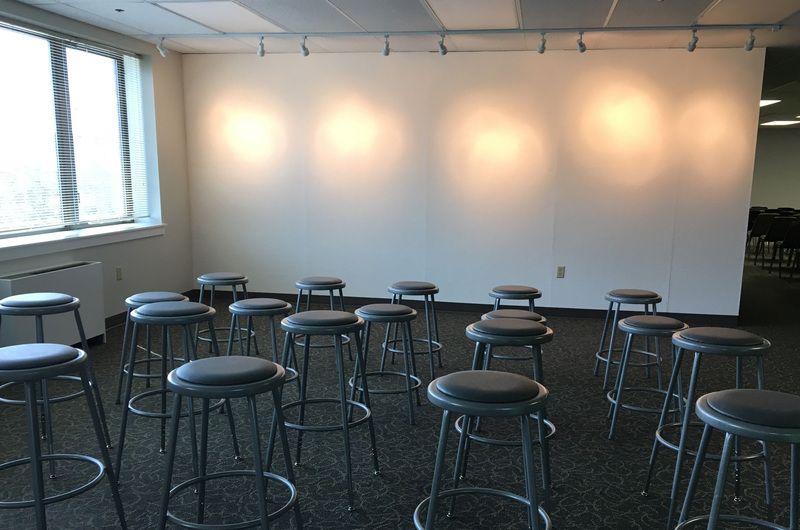 Here's a sneak peak of the center which is ready for use at the start of the Fall 2016 semester. 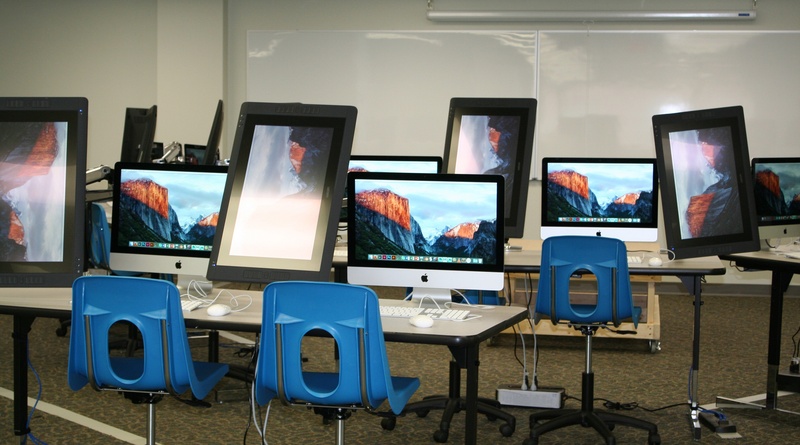 Twenty-one Cintiq workstations will occupy the largest portion of the space, allowing for use as a classroom as well as a lab space for individual work. Cintiq tablets are the industry standard for uses in animation & gaming, 3D-digital sculpting and video editing/motion graphics. Students from all disciplines will have access to the tablets that are mounted on an articulating arm, which can move the tablet into either an easel or desktop position. The easel position enables PCA&D's Foundation and Fine Art students to explore traditional subjects such as color, drawing, still – life arrangements, and figure drawing through digital tools. Digital Media, Illustration, and Graphic Design students may opt to use the Cintiqs in the desktop position. This space will also hold 21 Apple desktop computers similar to those in PCA&D's existing lab spaces. 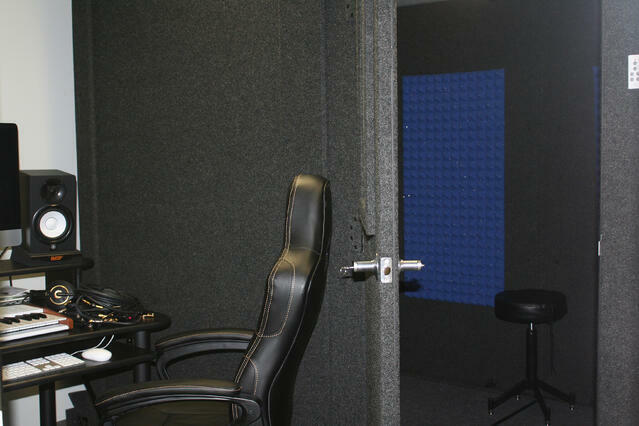 A sound room, a facility for recording and mixing, will be used by students as a recording studio to mix sound and record music, voice-over narration, or dialogue for their video, animation, and other digital projects. The space is specially designed to achieve optimum acoustic properties. PCA&D’s green screen room will allow students to meld video or photography with other digital art applications. 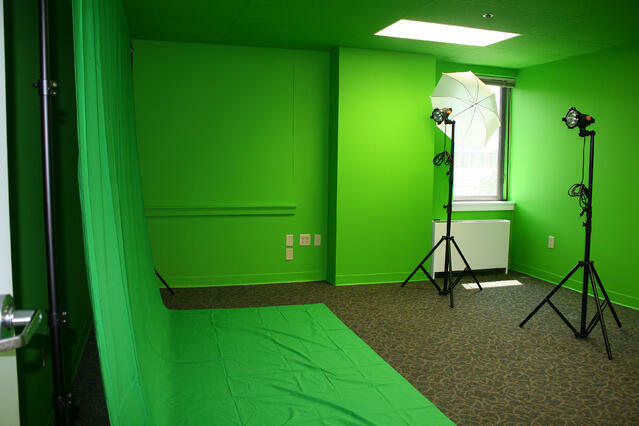 Green screen technology is the basis of the effects seen in everything from cinema to the weather forecast. The student shoots a video or photograph with the green backdrop. This color becomes digitally transparent and can be replaced with any other video clip, graphic or still image. With a green screen, an artist can superimpose anything or anyone into a background. The critique space will be flooded by light from the south facing windows overlooking Chestnut Street. This space will contain a crit wall, track lighting, and stools that can also be used for cintiq tablets placed in an easel position. According to Marc Torick, Academic Dean, the college believes that hand and digital tools have equal value in the making of art and design. A diversity of tools provide greater options to reach conceptual goals. It also provides skills to continue to learn beyond college. The new digital tools in the space represent an evolutionary leap in new capacities at the college allowing students to seamlessly integrate motion, sound, 3D digital modeling, and special effects into their work. This empowers students to explore and discover their own artistic voice and point of view, making them Strong Communicators, Strong Thinkers, and Strong Makers. Torick said, "With the advent of digital tools, art and technology have become entwined and PCA&D is thrilled to offer our students expanded opportunities to learn how to use these tools and use them to explore their concepts and communicate their ideas."